Palo Arte Woodworks is a woodworking studio. Here we present our woodworking skills for many generations. Founded by Jake Gevorgian, who is a well known man in the woodworking community for the local and international audience. At Palo Arte Woodworks we aim to present the best. We known how wood works, thanks to the many years of the study, and still we learn every day. This can be proved by our exemplary works seen in many high end houses. Because of our experience, we specialize in many aspects of the woodworking. Cabinet making, handmade furniture pieces with traditional dove-tail joinery, woodturning and traditional wood finishing. Our kitchen and bath cabinets are made with solid woods and American made wood plywoods. This material is made with American standards, which means it is made in a well regulated environment. It’s important to make sure that the materials used in your household are pure and don’t contain known poisons that were found in materials imported to America. extends the longevity of the drawers. This is a must have, while since the drawers are in constant use in the kitchen. There are so many specialty items that can be accommodated in the modern era cabinetmaking. We can’t speak about all of them at once, but here are some videos and pictures of our works for you to see. With that said, here is an example of a coplanar door system installed in a kitchen. This door system is ideal for tight spaces, for example, by the countertops. That is where opening and closing door shouldn’t interfere with the culinary items on the kitchen counter. Coplanar door system is ideal in this case. Just like in the previous example, see another example of the coplanar door system used under the office desk that provides convenience to the user. You don’t need to move away from the desk in order to open the large swing doors to get your printer paper from the storage. There are cases in modern and minimalistic kitchen cabinets where it’s important to keep the door gaps to a minimum width. But is it possible to keep the design and the functionality? With us, it’s possible! We use all of our engineering knowledge and invent user specific items to pass the requirements and still achieve the functionality. Here is an example of such case, where we have two pocket doors side by side and yet we have minimal width door gaps. 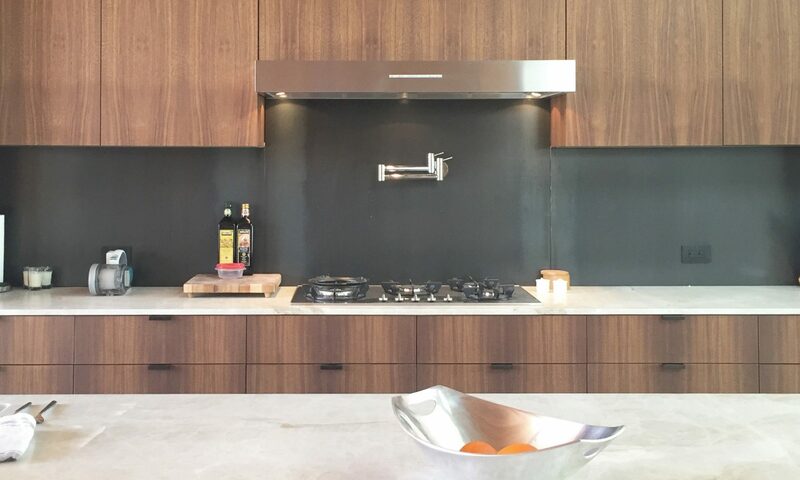 To see other examples of our kitchen cabinets, visit our gallery. Now that you know about our unlimited capabilities in woodworking and cabinet making, let’s read on about the process. The very first step is of course your idea. If you’ve a pretty good idea about what you want to be made, the rest is technical. Usually the people we commission with hire an architect or an interior designer who is experienced in alchemy. You’ll need someone who understands how materials work and this will save so much time for you. Once you’ve the person who will do all the design work based on your ideas, then that design in drawing can be shared among the craftsmen and craftswomen. In our case we usually take the drawing and convert it to a shop drawing. A shop drawing is the actual drawing of the product that will be made. It shows exact dimensions of the product, including that internal compartments are and what size they are. Once the product shop drawing is made, it awaits an approval from the knowledgable party who agreed to commission the artisan and then production begins! The anticipation is great. The feeling is as if you’re waiting for a new child to born. The handmade furniture making aspect of the woodworking is done without any machinery. Every cut, every joinery is made by hand, using tenon saws, chisels and cordless routers along with many other measuring tools. It is the type of work where the craftsman or the craftswoman takes their time to carefully decide and choose the wood, techniques to use and dream about it during the entire time it’s being made. By far it’s the most joyous aspect of the woodwork, because it’s made with so much care and attention. Most common woodworking joinery that we use in woodworking is the mortise and tenon and dovetail joinery. While we can also make Japanese joinery, where the interesting look of the joined wood raises eyebrow, we don’t often get requests. Although we would love to implement this Japanese joineries in our products, since it is very strong, looks beautiful and has centuries old history in China and Japan.